SOLAS life jackets general characteristics: The colour of SOLAS life jackets is always orange, and has been standardised, since orange is visible under all weather conditions. Furthermore, all jackets should have retro-reflective tapes, which are visible from an even longer distance. Commercial grade lifejacket manufactured in accordance with SOLAS 74 requirements. SOLAS life jackets general characteristics: The colour of SOLAS life jackets is always orange, and has been standardised, since orange is visible under all weather conditions. Furthermore, all jackets should have retro-reflective tapes, which are visible from an even longer distance. 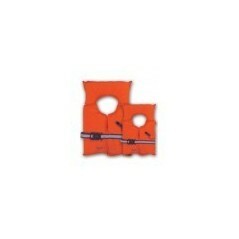 Commercial grade lifejacket manufactured in accordance with SOLAS 74 requirements. Available in adult and child sizes.